QuickBooks does let you use a closing date and password, however. The closing date sort of prevents someone from entering transactions earlier than the specified date. If you set a closing password, for example, someone needs to supply that password before entering a transaction or changing a transaction dated before the closing date. If you don’t set a closing password, someone trying to enter or change a transaction dated before the closing date is warned, but that person can still create or change the entry. 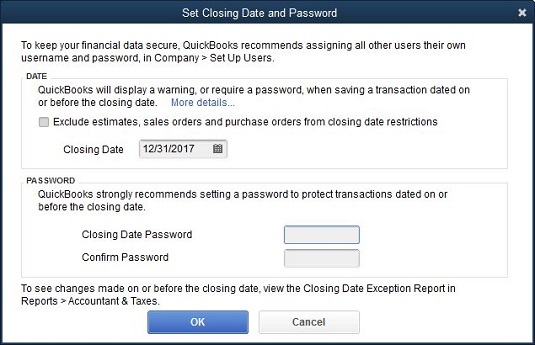 To set a closing date, choose Edit → Preferences, click the Accounting icon, click the Company Preferences tab, and then click the Set Date/Password button so that QuickBooks displays the Set Closing Date and Password dialog box. You enter the closing date (probably the end of the most recently completed year) in the Closing Date text box and then enter the password (twice): in the Closing Date Password text box and in the Confirm Password text box. Select the check box titled Exclude Estimates, Sales Orders and Purchase Orders from Closing Date Restrictions so you don’t lose access to these transactions as part of the closing. The Set Closing Date and Password dialog box. Don’t set a closing date and password on a QuickBooks file you want to send to your accountant so he or she can prepare your tax return. Your tax accountant will probably need to make changes in your QuickBooks file to sync things between your records and your tax return. You want to “lock” the preceding year only after your tax return is complete.